Salty and sweet, soft and chewy these easy to make salted caramel blondies are oozing with sticky caramel goodness. The perfect treat for any caramel lover! One could say I’ve been on a salted caramel kick lately, considering that yesterday I shared with you the recipe for salted caramel chocolate skillet brownie and as you probably know I’m all about chocolate, but these blondies, oh these blondies rocked my world! 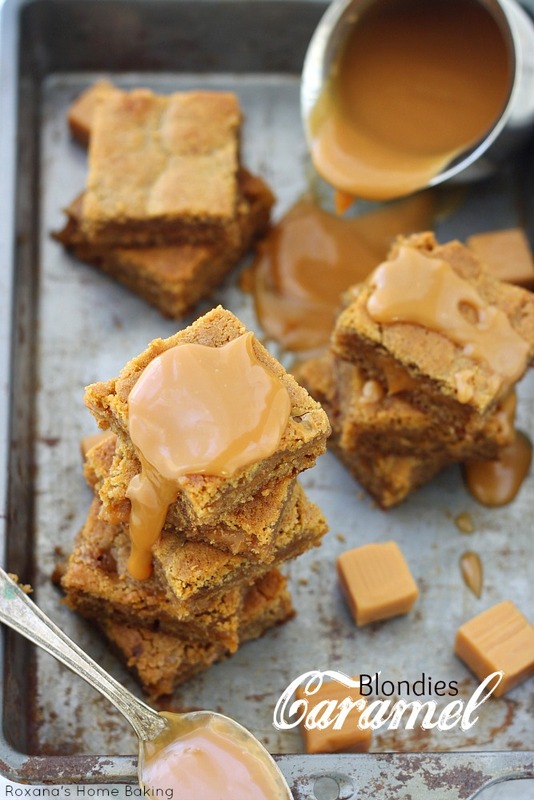 I’ve made these salted caramel blondies about two months ago it just took me like forever to edit the photos. The funny thing is that I had to stop editing and run to the kitchen and make another batch. Good thing they are so easy to make! Yes, you do need a mixer, a food processor and a sauce pan but still, it takes around 15 minutes to make them and almost 30 minutes to bake. I think most of the time you spend unwrapping the caramel candies. You can use your favorite caramel sauce if you prefer, just please, don’t use ice-cream caramel topping. Use a thick, rich caramel sauce or follow the recipe for my quick one : caramels and evaporated milk – heat and stir until melted. That’s it! 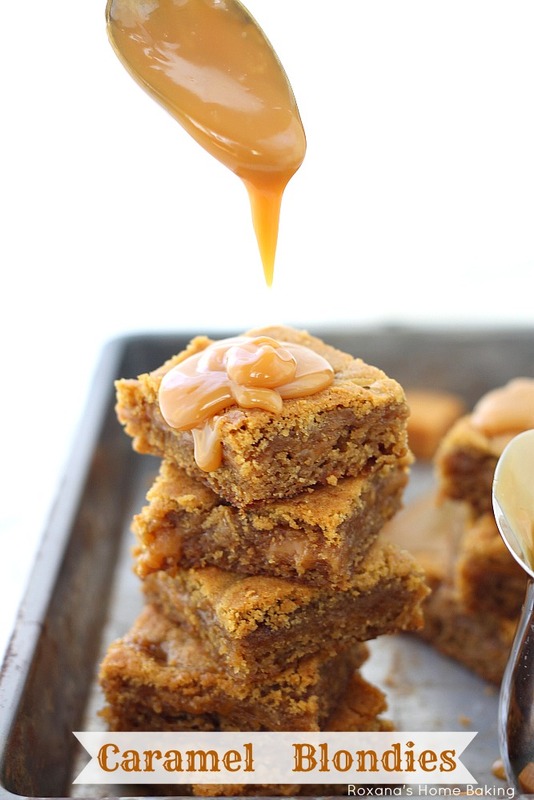 There are just a few variations to this salted caramel blondies recipe. If you’re not a big on sweet and salty treats you can skip the sprinkle of sea salt, although I honestly do not recommend that, but I do advise you to add a pinch of salt over the caramel once they are out of the oven. They will take you on a salty roller coaster through the caramel kingdom! 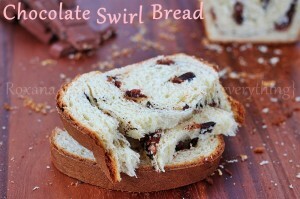 You can also add a few chocolate chips over the caramel layer if you feel like you can’t live without chocolate. I totally understand you. Salty and sweet, soft and chewy these easy to make salted caramel blondies are oozing with sticky caramel goodness. The perfect treat for any caramel lover! In a mixing bowl cream 1/2 cup butter with 1/2 cup sugar until light and fluffy. Add 1 egg and vanilla extract. Mix well, scraping the sides of the bowl with a spatula. Add 1 cup of flour and baking soda. Mix until just combined. Bake in preheated oven for 8 minutes. Remove from the oven without turning it off. In a small saucepan combine the 7 oz caramel and 1/4 cup evaporated milk. Melt over low heat, stirring constantly. To make the top blondie layer place 1/4 cup butter, 1/4 cup sugar, 1 egg and 1/2 cup flour in a food processor and pulse a couple of times. Crumble it over the caramel layer. This part is a little tricky since the dough is wet and somehow sticky, but with a little patience it will work. Return the pan to the oven and bake for 20 more minutes. As soon as you take the blondies out of the oven, sprinkle a pinch of salt on top (optional). Serve with more caramel sauce, if preferred. I think my jaw just dropped. These blondies look crazy delicious, Roxana! 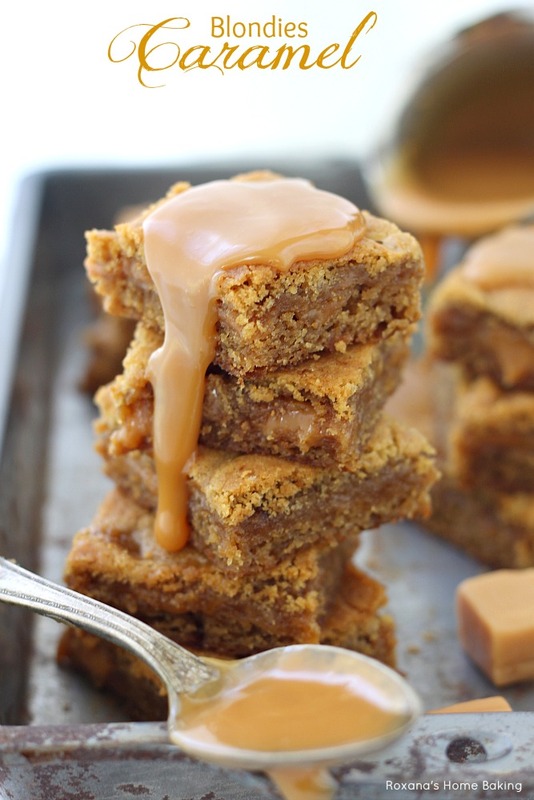 I'm reeeeeallllyyy coming around to salted caramel and these blondies look SOOO fantabulous! 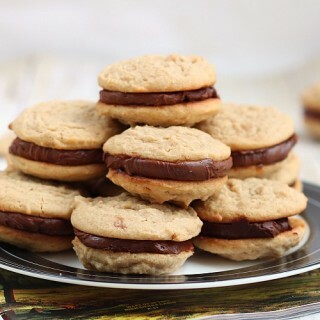 Oh my, these look over the top full of deliciousness! Ooooh that dripping caramel is so inviting! I'm dying over here! Whoa, I could eat a whole pan of these babies! LOVE them in all their caramel decadence!!! 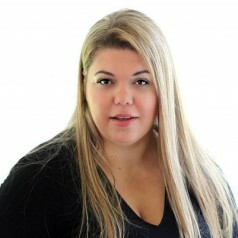 Wow Roxana, your pictures are totally drool worthy!! I NEED these! Holy cow, the centers of those blondies look dreamy! Wow...those pictures are amazing. If I could just grab a few of those, yes a few, I'd die a happy girl! I came here every day just to drool over your delicious desserts. Today is no different. These look amazing! Even if these were hard to make I would be in. They look amazing. I am a choclate girl too but every so often I need a caramel fix. I've never seen blondies look so darn mouthwatering, Roxana! These are amazing! Oh my gosh ... I bet these were amazing!! don't mind the salted caramel at all...keep 'em comin'!!! LOVE that stuff! And blondies are SO my thing! i love making bars and these sound delish! This may be my new favorite thing in the history of EVER. That caramel sauce is naughty and I want a bowl of it. OMG, I've found my weekend baking project! 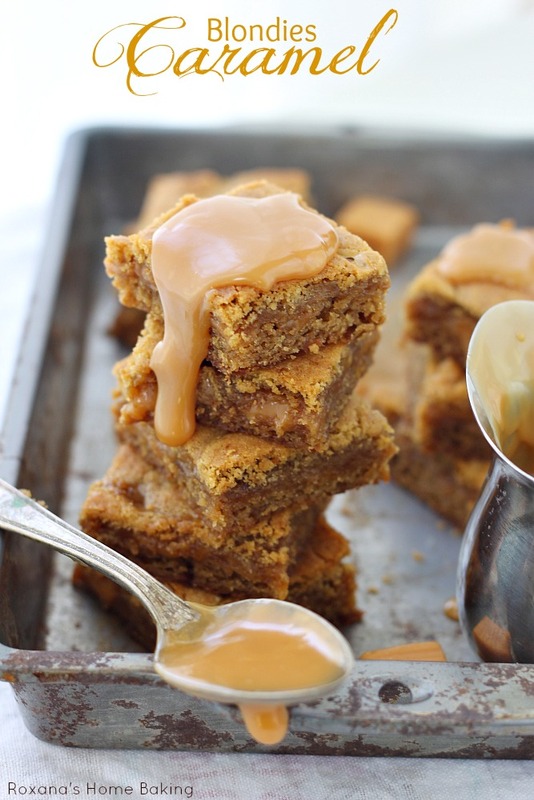 Love salted caramel blondies...I can taste it in my mouth now. These look amazing. I LOVE CARAMEL! And I just learned to make caramel sauce for a bake-off I did last year. I might have to make these for my own birthday. Holy cow. These look amazing! You have the gooey and drippy thing down. Awesome job. 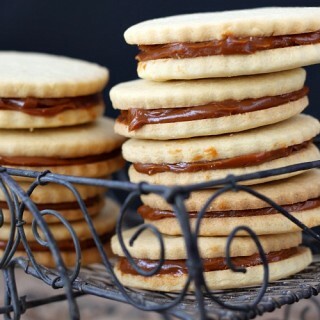 :) And I need to try this salted caramel thing. I've of course tried caramel but never salted caramel! Hi! These sound great but I'm a new chef/baker and we don't own a food processor. Any suggestions? I just saw these on Pinterest and wanted to drop by to tell you that they look absolutely wonderful. I've been looking for a blondie recipe and this is definitely on my to-do list this weekend. Thanks for sharing. 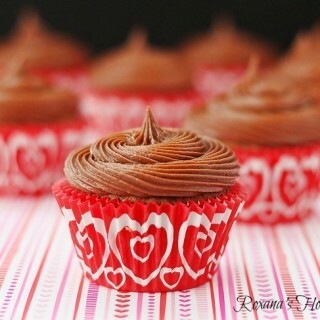 These look delicious Roxanna, I love your photography it's stunning. Thanks for hosting this month. I would love 100000 of these, please! I made these but switched out the caramel for raw honey (the solidish type). I looove honey and they turned out pretty good! awesome recipe and great directions. I'll be back for more! Roxana, How did I miss these blondies! 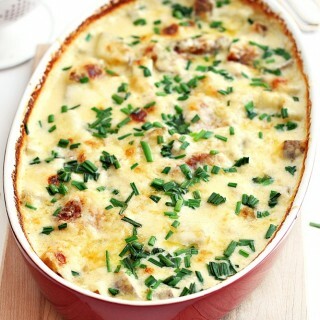 They look totally amazing your photo skills and cooking skills together having me drooling. I have your salted caramel chocolate skillet brownies in the oven as I write this and now I'm thinking about making these next! Could it be ppossible to add my own caramel sauce in between layers or I need to use the one you use in your recipe? 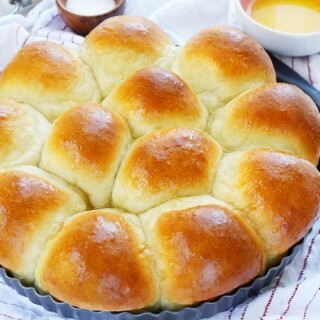 I can't wait to make them! Your pictures look yummy! These photos are amazing! You always blow me away with your creativity! And now I want some brownies! If you put the caramels in the freezer the cellophane will come off much faster. I had the same issue Lori. Next time I will start the filling first, it took about 20 minutes to melt the caramels, while the bottom layer was done much faster. The top layer was really more of a paste, and hard to disperse on top of the melted caramel layer. Still tasted delicious, just didn't look too appealing. I will try this. Looks very moist and crumbly at the same time. This dessert looks amazing! I love indulgent desserts. 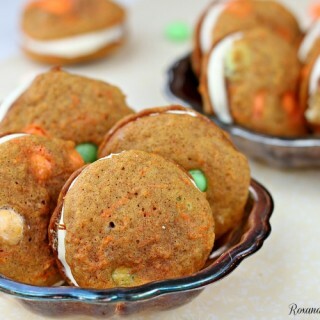 The caramel sauce just make them over the top. Yum! Thanks for sharing! What size pan did you use, it seems like a small batch. Most brownie recipes call for at least 2 cups flour. Hey! These blondies look AMAZING and I can't wait to make them. We don't have Kraft caramels over here, though, so when making my own salted caramel sauce, how much of it should I use in the recipe? One could argue that you can never have too much caramel, but we all know how precise baking is ;). Thanks!